Sliced the lemons in halves and rub it all over the chicken while rubbing squeeze some of its juice out onto the chicken when done leave the lemon skin inside the chicken to be baked with it, then add all the herbs. Cut the onions in halves and place them with the chicken only one half inside the chicken. 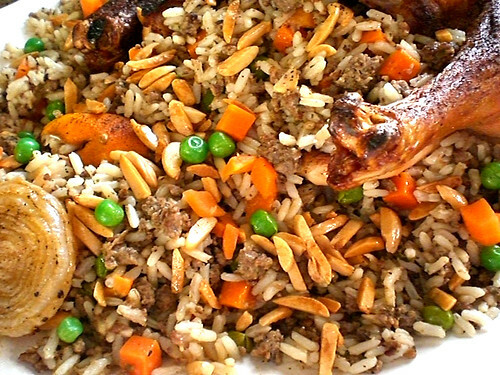 While the chicken is cooking, you can start on cooking the rice. Add 4 cups of hot water, cook on low heat and covered pan. 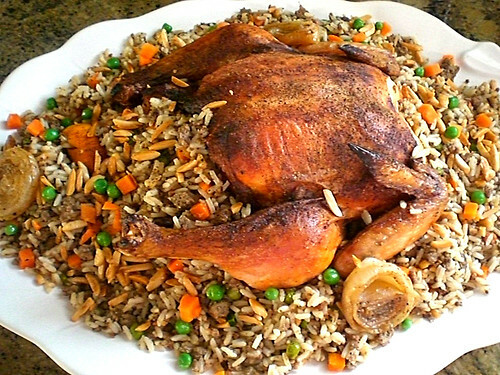 Get your large serving platter place the chicken in the center and stuffed with the cooked rice and vegetables. Add the almonds on top and garnish with the cooked onions and lemons. ~ by simplyheavenfood on March 18, 2009. That chicken looks to die for. Delish! Thank you Jenn! I really had fun creating it! It was very yummy. This looks simply amazing! Can I pls have the recipe? Thank you! !For sure, I will be posting recipe soon. Did you ever post this recipe? I would love this recipe as well as the cucumber/tomato salad I saw on another post. 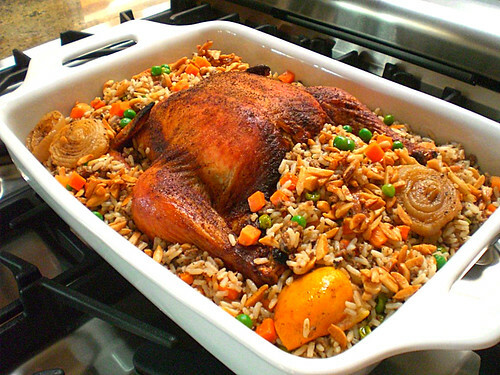 I am going to try your nutty rice for my mother in law for mother’s day! Thanks! How long do you cook the chicken? Usually I preheat the oven to 400 and bake for about 1 hour, it could take little more time, it depends on the oven, personally I take it out when I see it golden brown.